To produce agave syrup from the Agave plants, the leaves are cut off the plant after it has aged seven to fourteen years. The juice is then extracted from the core of the agave, called the piña. The juice is filtered, then heated to break the complex components into simple sugars. This filtered juice is then concentrated to a syrupy liquid, slightly thinner than honey. Its color varies from light- to dark-amber, depending on the degree of processing. Agave salmiana is processed differently from Agave tequiliana. As the plant develops, it starts to grow a stalk called a quiote. The stalk is cut off before it fully grows, creating a hole in the center of the plant that fills with a liquid called aguamiel. The liquid is collected daily. The complex components of this liquid are broken down into fructose and glucose. 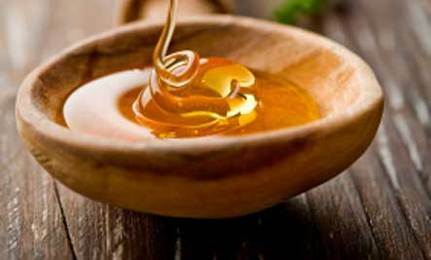 Agave syrup is 1.4 to 1.6 times sweeter than sugar and is often substituted for sugar or honey in recipes. In cooking, it is commonly used as a vegan alternative to honey for those who choose to exclude animal products from their diets. Agave syrup dissolves quickly and so it can be used as a sweetener for cold beverages such as iced tea. It is added to some breakfast cereals as a binding agent. Agave syrups are sold in light, amber, dark, and raw varieties. Light agave syrup has a mild, almost neutral flavor, and is therefore sometimes used in delicate-tasting dishes and beverages. Amber agave syrup has a medium-intensity caramel flavor and is therefore used in dishes and drinks with stronger flavors. Dark agave syrup has stronger caramel notes and imparts a distinct flavor to dishes, such as some desserts, poultry, meat, and seafood dishes. Both amber and dark agave syrups are sometimes used "straight out of the bottle" as a topping for pancakes, cakes, waffles, and French toast. The dark version is unfiltered and therefore contains a higher concentration of the agave plant's minerals. Raw agave syrup also has a mild, neutral taste. It is produced at temperatures below 118 °F to protect the natural enzymes, so this variety could be considered an appropriate sweetener for raw foodists. Recipes using Agave Nector see Here and Here.